I encourage every single grower to make seeds for themselves. A lot of people have been asking how, so I put together these basic tips. Hopefully, it helps a lot of people and is fairly straightforward. This isn’t meant to make you a breeder or share all my techniques or secrets, this is to familiarize you with the process of creating seeds. 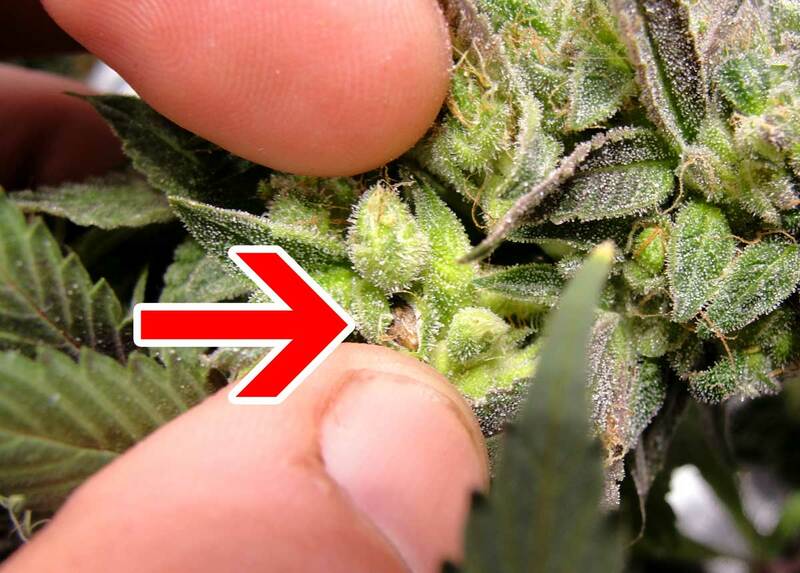 It’s easy to make your own cannabis seeds at home! It’s a shame that many grow books tell you only to throw away your males. 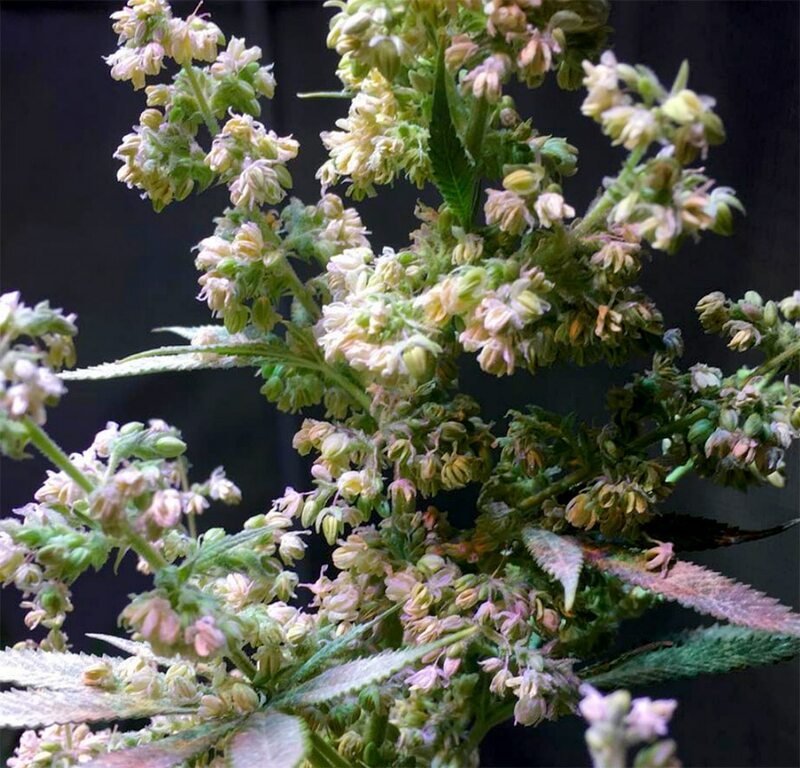 New growers may not know, but anyone who’s grown for even just a few years gets to the point where they wish they still had something they grew in the past, which is no longer available in seed or clone for whatever reason. The older you get the more it happens. Seed lines disappear entirely once they run out, and due to people not making their own. It’s good to be self-sufficient. 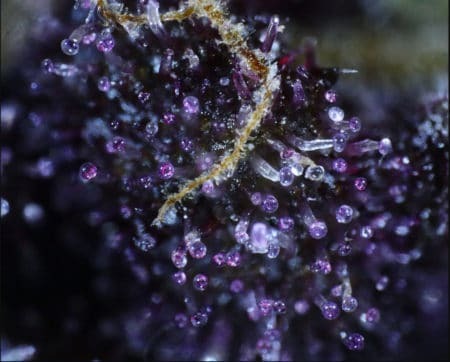 While it’s always fun to check out the hard work of your favorite breeders and their strains, it’s equally as important to pollinate a branch or two for yourself here and there and see what magic you can create or preserve. Please share this article if it helps or inspires you. Big agriculture is coming to the cannabis growing world and has the ability to change the plant forever once contamination happens, just like in the veggie world. We are losing genetic diversity fast as thousands of unique strains are lost. Please do your part if you are passionate! These are basic starting points for the home grower. I believe every person who grows cannabis needs to have this skill. Every strain goes away over time when people don’t make more seeds. Growers should know how to make their own seeds for preservation and sustainability. These skills can go a long way. The precursor to serious breeding is the basic technique of creating the seed. Male plants can be grown in very basic conditions in an isolated space, then flowered for pollen. 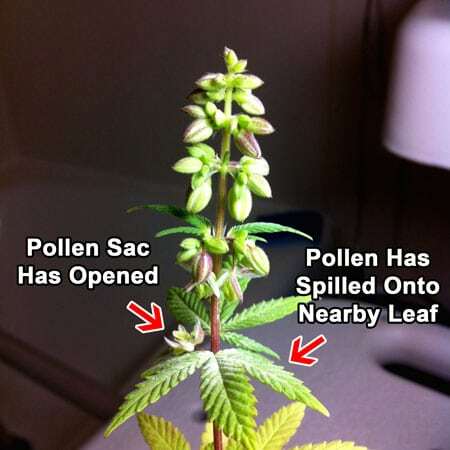 Males can be started flowering next to females with a close watch for the first week or two, but be careful and remove them before pollen sacks form, bursting open and pollinating everything. Branches can be cut off and put into a cup of water on a windowsill or under a CFL bulb, even under veg light cycle once they are in bloom. Pollen can be collected within a week from these branches, saving lots of space. Males can also be cloned or flowered very small based on your needs. Pollen can be collected by tapping a budding branch gently over a piece of paper. Pollen will spread easily in the air, so make sure to turn off all fans. Visit males only after tending to female plants so you don’t accidentally bring any stray pollen on your clothes or hair! Take out your female to be pollinated or shut off all circulation fans. Gently apply pollen to a labeled branch. 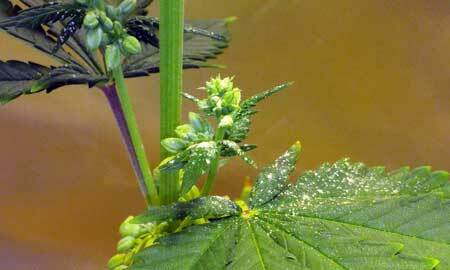 The pollen must meet the white flowering hairs to create seeds. 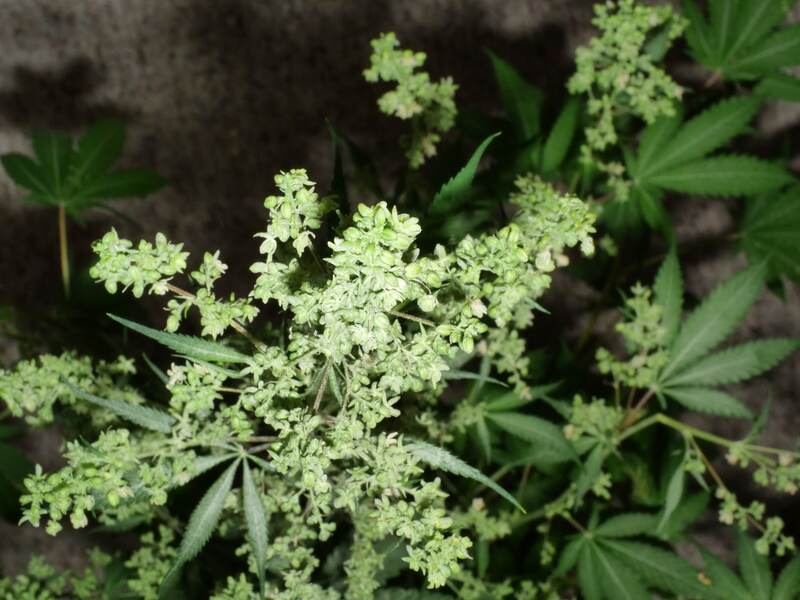 Week 3-5 is best to pollinate, and you can do a single bud or branch per plant and keep the rest seedless. Every pollinated branch should be labeled properly, your memory will not last as you think it will. A proper branch label includes dates, strain names, breeder/sources, and has the female listed first and male listed second. An example label looks like this: 4/20/2015 – Star Pupil (Mass Medical Strains) x Prayer Tower Sativa 9 (Bodhi Seeds) and the label should be kept with the seeds when they are finished. As years go by, you will be thankful for the dates and breeder information, which can escape our memory on occasion. Water generally deactivates pollen, wash clothes and shower if needed after handling. 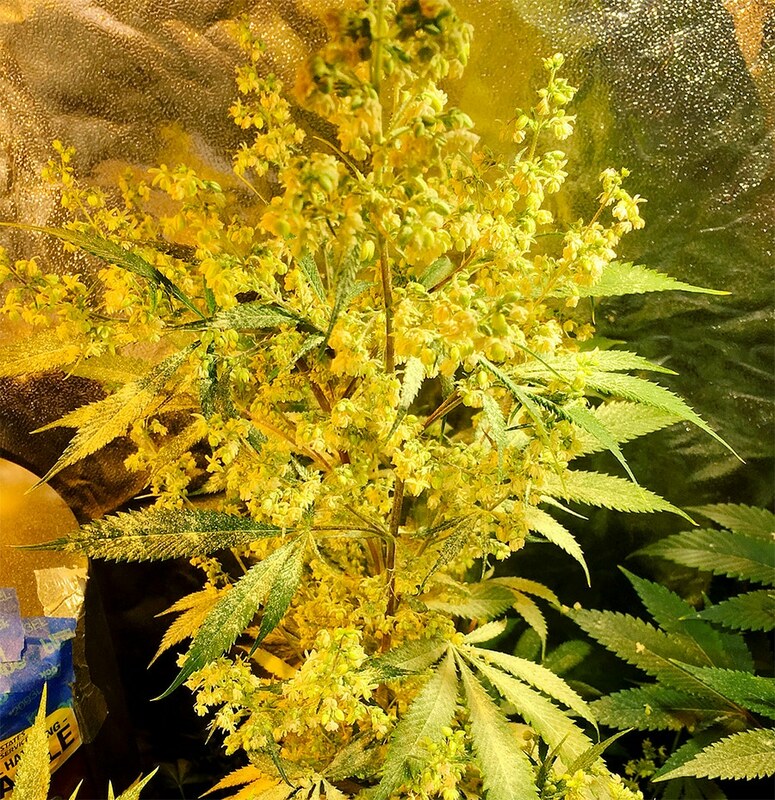 3+ hours after pollination, the plant can be sprayed down with water to deactivate stray pollen and can be brought back into grow room and fans turned back on. Avoid spreading pollen unintentionally. It can get everywhere! Seeds are done in 2-6 weeks and should be dried in the bud when the plant is harvested. Seeds should be sproutable within one month of drying. 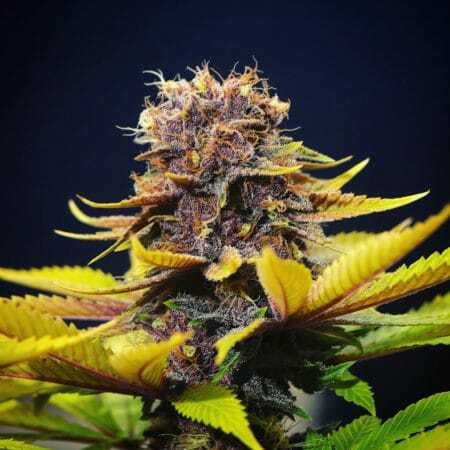 Any strain with traits that you like, which speaks to you, or seems like a good cross, means your intuition is telling you something. Starting with stabilized or homogeneous lines is always a benefit. Certain genes such as Cookies, OG, and Diesels, are full of hermaphrodites and should be used with caution, only to be bred with if they are really your #1 passion. Follow your heart. Crossing two unrelated strains for the first time is called an F1. Crossing a brother and sister F1 of the same strain creates an F2, and so on. Selections play a huge role in what the outcome will be. Making F2 seeds of an F1 you purchased, will not give you the same seeds. Rather, you will see new phenotypes resembling some of the parents and their parents, etc. With huge potential to find new special plants within. Many combinations will work great, and some will not. If you fail, try again, selecting new parents. Each combination is unique. A and B might work great together, and C and D might work well together, there’s still a possibility that A and C combine to create junk. Every parental combo is unique! If you see a unique trait that you like, make seeds! Selecting a good female is easy, flower female plants from seed and again from clone to test stability. Smoke test is important. 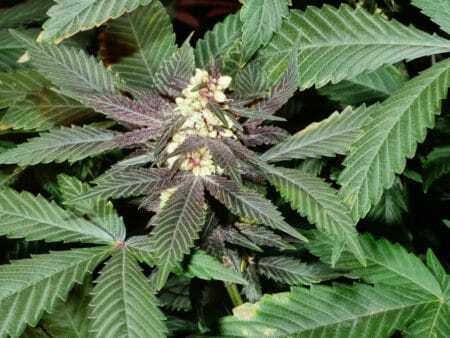 A potential mother plant should have all the high-quality traits that matter to you. Hermaphroditic plants are to be avoided. Female plants to be pollinated should have all your ideal traits. Use only your best females. Selecting a male, you have to use your senses a lot. The ones who grow best and smell best are a good starting point. Structure and root growth are important. Hollow stems may indicate high THC potential. Cut the top off a couple nodes down and find out. First showing or fastest flowering males are generally discarded. Very slow blooming late males are often times more recessive although not always. I like them. 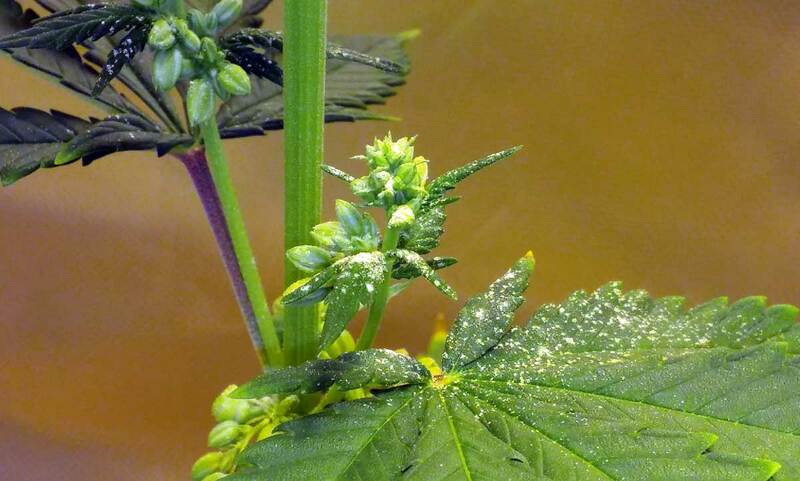 Males will start to drop pollen before they are “done” flowering enough to see their true traits. 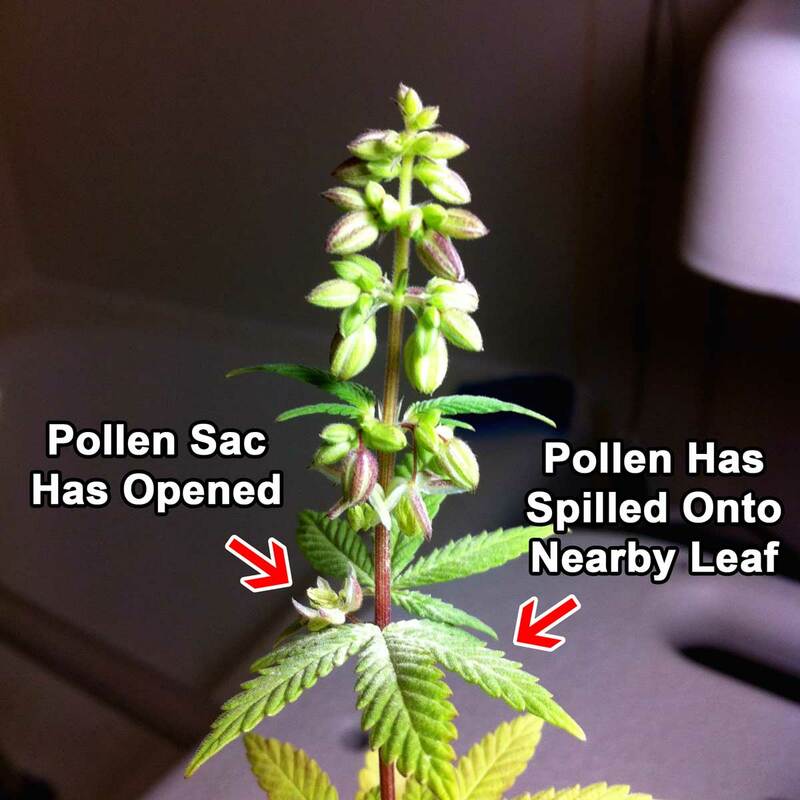 As a beginner, you can use the pollen at any stage, but those doing real selections are advised to always flower your males for weeks after the pollen starts. For male selections, a strain you’ve grown before and enjoyed the females is a safe starting point. Watch for resin production, look at how the flower clusters stack and produce. 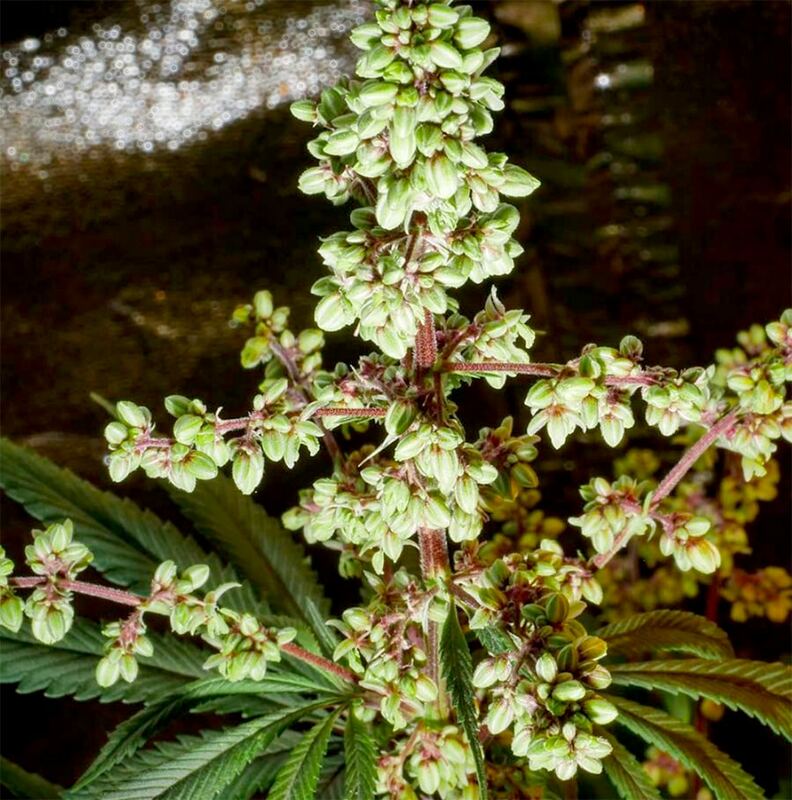 The male flowers form similarly to female flowers, large yield potential is often apparent in largely formed male clusters that can look almost like female buds from a distance. The more males you have to choose from, the more fun you will have! Male plants can be a lot of fun to grow, too. Just like the females of the genetics they come from, they all have their own characteristics and unique traits. Once you get into “hunting males” you could get hooked! Some of my prized male selections from over the years are shown here. You’ll see resin production and traits of large floral clusters, as well as unique coloration! 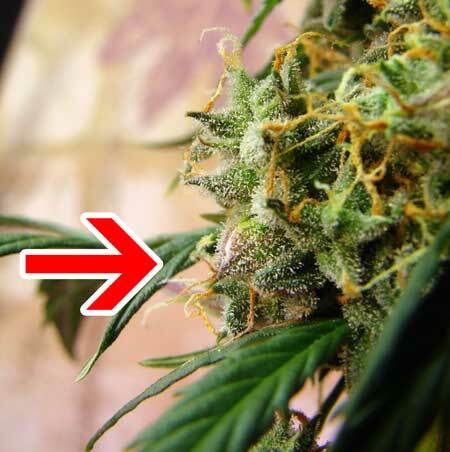 This male Weapon X cannabis plant is about to pop! For more advanced breeding selections, I recommend starting ideally a few hundred seeds. (For beginners, as many as you can is great, will help you find the best ones you can. Use your intuition!) 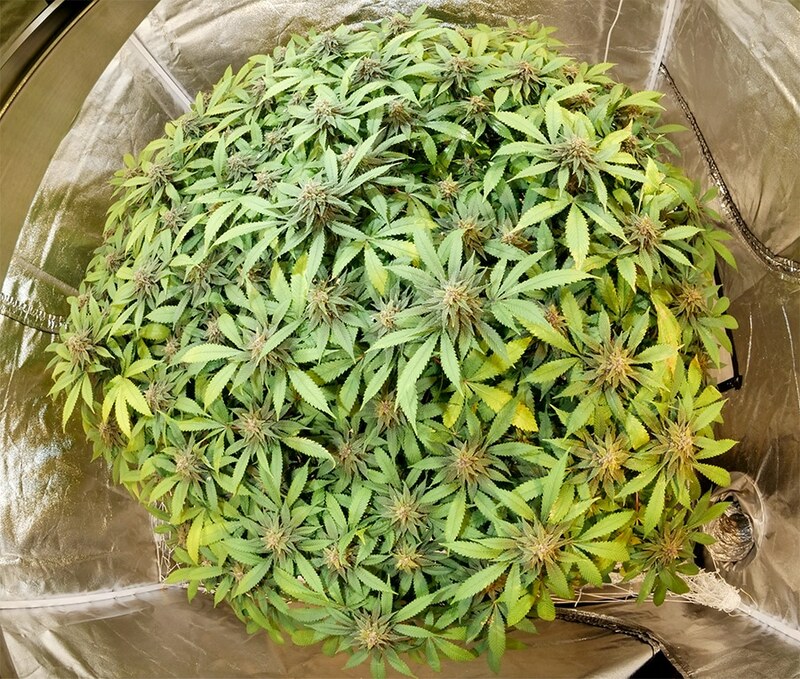 Plants can be weeded out every few weeks selecting only the best contenders to flower out, and a lot can be achieved in a spare tent or closet this way, while still selecting through large populations! Clones of a prized breeding male may be kept in veg the same way females are, to be used again and again once their offspring are proven good! This is how a breeder can create the same batch of seeds for years and years, by using the exact same parents held in clone form. 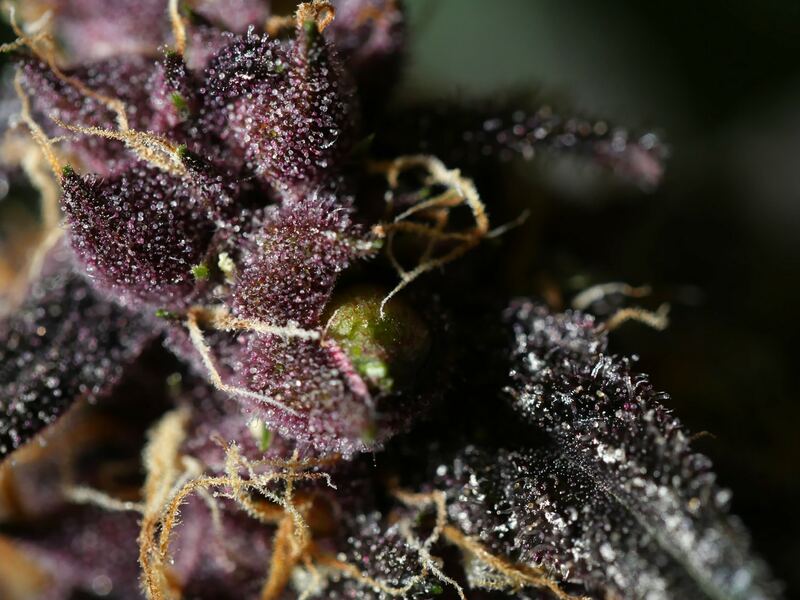 These tips are just the beginning, and the purpose isn’t to teach you how to breed, but to teach you how to learn your own path and style of creating seeds and preserving our very special plant. The seeds you create will always be a very special grow for YOU. Making your own seeds is more important than ever. We must do our part to preserve the natural genetic diversity of this healing plant as it has evolved for millions of years. Home growing is an important skill as commercial and medical cannabis is increasingly full of toxins and scary new technology. Please grow responsibly with love. 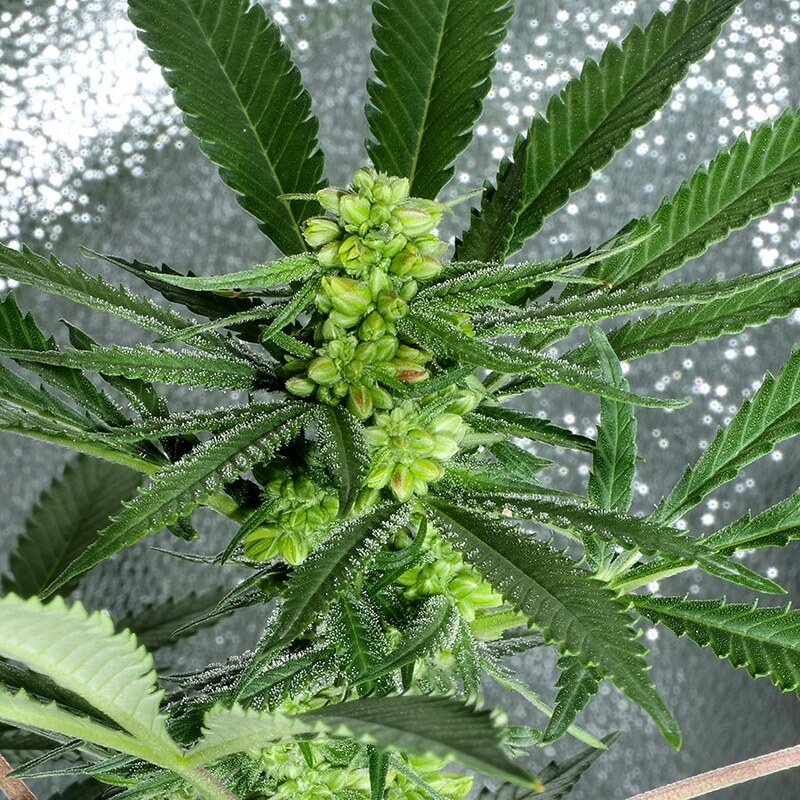 Star Pupil strives to copy nature while incorporating breeding techniques and plant knowledge passed down from generations of experienced growers. 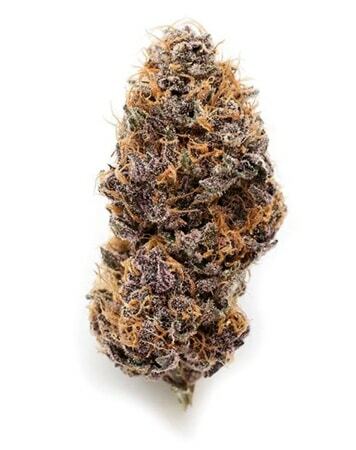 Mass Medical Strains is located in western Massachusetts and all breeding and growing methods are 100% organic. Each and every plant is grown and harvested with wholesome intentions and positive vibes.